I like blogs. I think they are a nice example of technology coming around to meet the way people interact. For years we’ve said that the secret to a web site was to keep refreshing the content, so people would want to return. The difficulty in keeping content fresh was as much a technological problem (the annoyances of editing, publishing, etc. both at home and on the road) as well as psychological (what needs to be updated, what do people want to read). 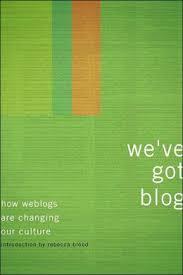 The blog is to the 2000s what desktop publishing was to the 1980s: expanding publishing tools out to more people. Will everyone write a blog? No. In the 1980s, not everyone wrote a ‘zine (although it started to feel like it at times). The comparison continues, as early ‘zines suffered from overuse of fonts and design elements that blogs now mirror in incompatible HTML coding and stylesheets. None of this takes away from the very real power of allowing people to publish their writing faster, quicker, and better. I feel I must say this so that you understand that my negative reaction to this book is to the book itself, and not the book’s subject. We’ve Got Blog is a mishmash of articles, mostly (if not entirely–I couldn’t tell) reprinted from blogs themselves, that tries to define blogs, why they are important, and how they may affect the future of journalism and the Internet. A few of the articles are well-written and interesting; most, however, suffer from their origins in that they seem quite ephemeral and off-the-cuff. Despite the “solution” to do links in the originals as endnotes, when you read text in a book that lacks the immediacy to check out the links, something is lost. If anything, the book truly makes it clear the difference between print and screen. Most of the articles seem strange because of the very ephemeral nature of how they were originally published, how putting them in a compiliation removed them from the very time and place that they were meant to be. This is especially true of the extended conversation about MetaFilter from MetaFilter that ends the book, where the banality of the conversation overwhelms the permanency of acid-free paper. I’m 0 for 2 in reading books about blogs (I wasn’t much impressed by Rebecca Blood’s handbook, either), but I remain committed to the medium in spite of this.We’ve Got Blog is useful for the historical record (although the Internet Archive probably could have provided this as well), but we’re still waiting for the book that will truly help codify what the fuss is all about.